Actions speak louder than words, so the best way to truly understand your customer is to track how they engage with you at every opportunity. With careful analysis of your data aligned to your business questions — guided by Blast — you can find out who your customers are, what they respond to, and how to widen your audience to dramatically improve sales and meet all of your business goals. You won’t be looking at customer data from just one channel at a time, either. In Adobe Analytics Standard, you can bring various marketing channels together to get a comprehensive view of marketing performance. Share the story with simple built-in sending ability — no need for exports and attachments. 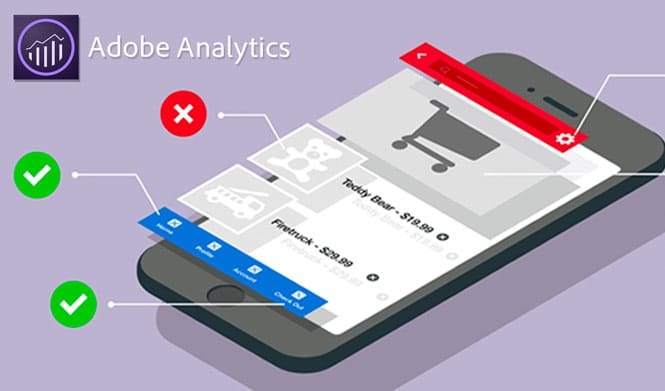 As part of the Adobe Marketing Cloud, Adobe Analytics Standard can be used as a standalone solution or integrated with Adobe’s other marketing tools. Reports and dashboards visually organize your data and make it easy to share. Unlimited breakdowns of dimensions, metrics, and date ranges help you identify and compare high-value segments. Real-time automation allows you to take immediate action on your findings. Customer retention and experiences are improved through analysis of how they interact with your properties. Ad hoc analysis can easily be conducted when your data priorities suddenly change. Several of our clients have reported a bit of a “speed bump” when trying to implement Adobe Analytics Standard on their own. That’s one reason that so many of our analysts are Adobe-certified. We can guide you from the early stages all the way through refining your metrics until you get the exact answers you need. Strategy – Understanding your business and challenges is the first, critical step. Through deep research and discovery, we ensure your implementation is designed to gather the data most relevant to you. Implementation – Getting Adobe Analytics Standard up and running is easier with experience. We’ll make sure to correctly set the parameters for the custom dimensions and metrics that were recommended during the strategy phase. Optimization – Data analysis is a continuous process. Reports are studied regularly to make sure data is “clean” and metrics are still relevant to goals. Training – Blast’s Adobe Analytics certified consultants provide ongoing education and training to guide your sustained success. If you’re ready to work with the leader in the analytics consulting industry, to take the guesswork out of customer insights by optimally implementing Adobe Analytics, our certified, expert Adobe Analytics analysts will make sure you get the results you need. Blast can also help you compare Adobe Analytics Standard with Adobe Analytics Premium, Google Analytics, Mixpanel, and other tools so you can make a well-informed decision in selecting the best platform for your organization. After launching a new mobile website, a global specialty toy retailer noticed that their mobile revenue for both “Click and Collect” and “Home Delivery” methods had decreased considerably. Ready to get started with an Adobe Analytics implementation audit? Or are you interested in learning more about our analytics consulting beyond Adobe Analytics Standard? Blast offers business analytics solutions and complete digital analytics consulting services.